Croup presents itself as a severe form of cough. It commonly occurs among children between six months and five or six years of age. In fact, around fifteen percent of children will suffer from croup at one time or another in their lifetime. It rarely occurs among teenagers and adults. The following article discusses common questions about this condition. Doctors make a diagnosis of croup only when other things have been investigated. The doctor makes sure that there is no epiglottitis, subglottic stenosis, angioedema, retropharyngeal abscess, or an obstruction of the airway by a foreign body. Then, the doctor requests for tests to be done such as complete blood count, X-rays and culture of the suspected pathogen as needed. 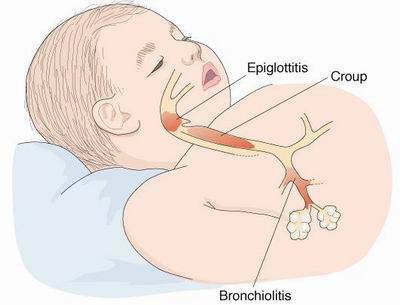 Croup, also known as laryngotracheobronchitis, leads to swelling of the larynx, trachea and large bronchi. Infection causes the swelling (due to the infiltration of white blood cells). The swelling interferes with normal breathing and causes the characteristic “barking” cough likened to the call of a seal or sea lion. Stridor, a high-pitched sound resulting from turbulent air flow in the upper airway upon inhalation, becomes worse at night. Stridor accompanies hoarseness and causes worry among parents of the affected child. Stridor decreases as croup worsens. It increases when the child cries or becomes agitated. Sometimes, the affected child also suffers from fever, indrawing of the chest wall and coryza—similar to the symptoms of a common cold. The symptoms may be mild, moderate or even severe. However, the affected child rarely needs to be hospitalized and a very sickly appearance with or without drooling indicates other medical conditions. Spasmodic croup lacks the usual signs of infection (such as fever, sore throat and increased white blood cell count). What are the causes of croup? Diphtheria caused croup in the Western world before the advent of a successful vaccine. Viruses commonly cause croup more often than bacteria. Acute laryngotracheitis and spasmodic croup represent viral forms of croup. Laryngeal diphtheria, bacterial tracheitis, laryngotracheobronchitis, and laryngotracheobronchopneumonitis represent bacterial forms. Viral croup involves a milder symptomatology than bacterial croup. Among the viruses that cause croup are parainfluenza virus (primarily types 1 and 2), influenza A and B, measles, adenovirus, and respiratory syncytial virus or RSV. Corynebacterium diphtheriae causes laryngeal diphtheria. On the other hand, viral infection with secondary bacterial growth causes bacterial tracheitis, laryngotracheobronchitis and laryngotracheobronchopneumonitis. Staphylococcus aureus, Streptococcus pneumoniae, Hemophilus influenzae, and Moraxella catarrhalis commonly cause bacterial croup. Prevention by immunization for influenza and diphtheria still outweighs treatment. Affected children should kept as calm as possible to avoid worsening of symptoms. Doctors administer steroids (corticosteroids such as dexamethasone and budesonide) routinely, with epinephrine for severe cases. Doctors hospitalize children if further observation or oxygen administration is required. Steroids alleviate the symptoms six to twelve hours after administration. Doctors administer steroids orally, parentally or by inhalation, with the oral route being preferred. Epinephrine produces faster reduction in severity within ten to thirty minutes upon administration. However, the alleviation of symptoms lasts only about two hours. If the condition continues to improve after treatment and no other complications arise, the doctor sends the child to continue recuperating at home. Other “supposed” treatments for croup show no significant effectiveness. These include cough medicines and self-care treatments such as humidifiers.